Warranty Direct has launched a smartphone version of its website designed to make it even quicker and easier to get a quote or to make a claim. WD claims to be the UK’s leading provider of direct automotive warranties and has around 50,000 live policies active at any one time. 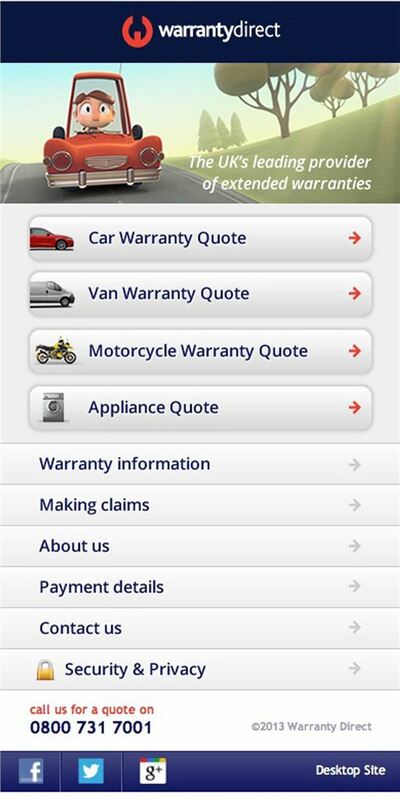 Warranty Direct’s Smartphone site, housed at m.warrantydirect.co.uk, allows new customers to input the details of their vehicle and get a quick quote on the move, while existing customers can also make a claim without having to wait until they are sitting in front of a computer or able to call. Duncan McClure Fisher, managing director of Warranty Direct, said: “We live in an increasingly mobile world and we know that people’s time is precious, so we’ve made our smartphone site as easy and intuitive to use as possible. The smartphone site contains a simple quote generator, information about warranties, capability for existing customers to make a claim and important contact information, should contact with the call centre be needed. Warranty Direct is one of the only companies to cover many of the ‘loophole’ clauses excluded by most extended warranty providers. These include parts failing through wear & tear, failure of an insured part caused by the failure of another uninsured part and faults found during standard service and MOT procedures. Cover starts from as little as £15 a month. For more information or for a quote, go to www.warrantydirect.co.uk or m.warrantydirect.co.uk.